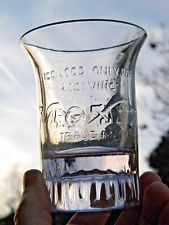 Thursday, March 8th, 2018 at 6:30 pm at the Meriden Public Library, 105 Miller Street, Meriden, CT.
Ruth Ann Davis, a retired psychologist and a long time antique dealer, has been a collector of advertising glass giveaways since 1980. She will be sharing her knowledge and some of her collection with us on March 8th at 6:30 pm at the Meriden Public Library. This meeting is open to the public. Refreshments will be served. The Andrews Homestead, will be open to the public every Sunday in May from 11:00 till 3:00 with a special exhibit that will feature tea sets and coffee sets by International Silver and its predecessor companies and smoke related items. In addition, our silver display cases will be restocked and will feature new items from our International Silver Co. Collection. The exhibit will open with a tea party special fundraising event. Saturday, May 5th, 2018 at the Andrews Homestead, 424 W. Main St. Meriden CT (sharing a parking lot with the Benjamin Franklin School). Table settings will feature tea sets and coffee sets from the Society’s International Silver Co. Collection. Details to follow in next month’s news letter. 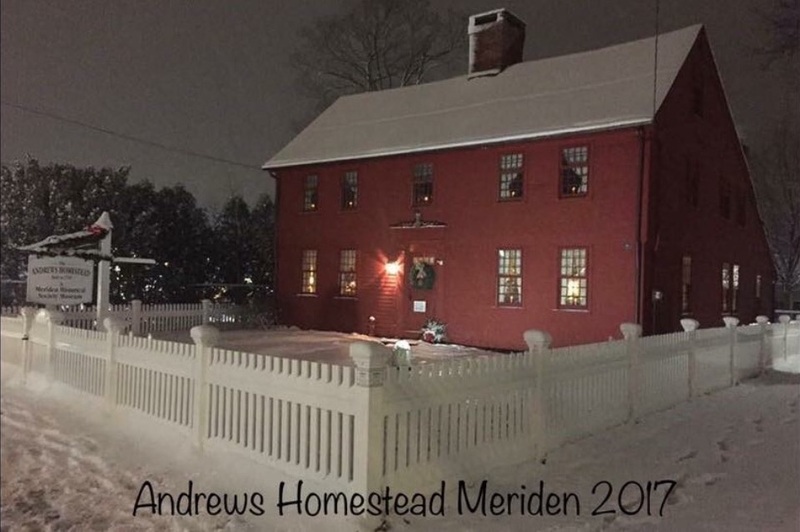 Our Christmas open house at the Andrews Homestead was held there for the first time in over 40 years. In spite of the snowy weather, people came to enjoy the holiday atmosphere. It was an overwhelming success and we hope to make it a yearly tradition. 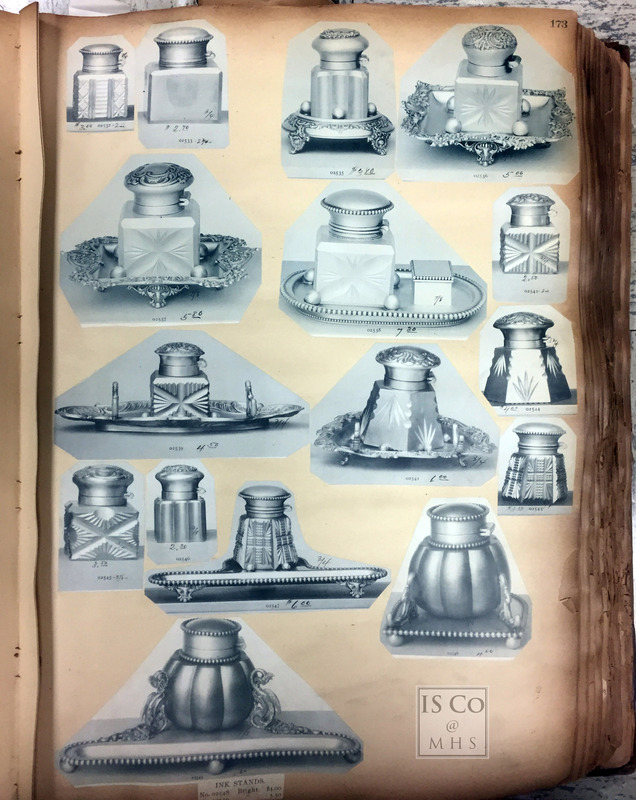 Among the documentation from the various companies that formed or became a part of the International Silver Company are a large number of scrapbooks. 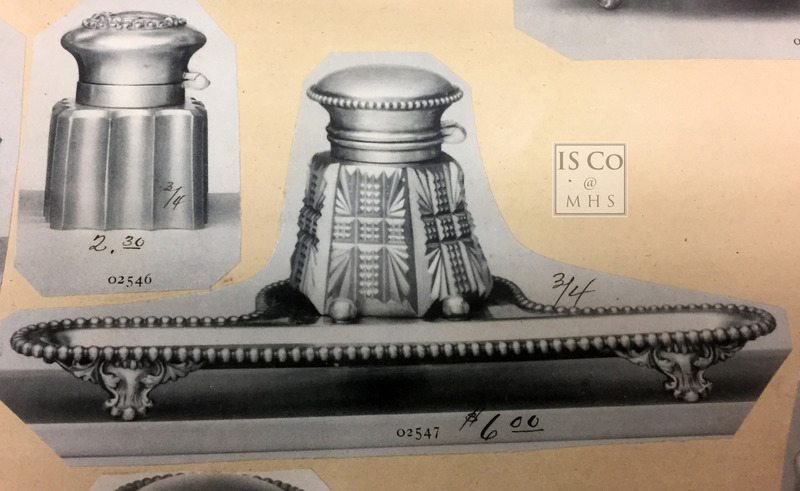 While the majority of the scrapbooks in the Archives contain copies of trade and popular magazine advertisements, somewhat unique among the collection are those from the Meriden Silver Plate Company. These scrapbooks are large, unwieldy items but instead of magazine advertisements, they contain clippings from their product catalogs arranged by item number. Dates are not noted next to the items so it unfortunately does not allow you to put a specific date on a particular pattern but what is possible is to see the configuration of an item as offered in the original catalog. This can be quite useful when trying to determine if a particular item is missing a metal or glass part or whether a glass item (bowl or vase etc.) is original to the piece or possibly a later replacement. 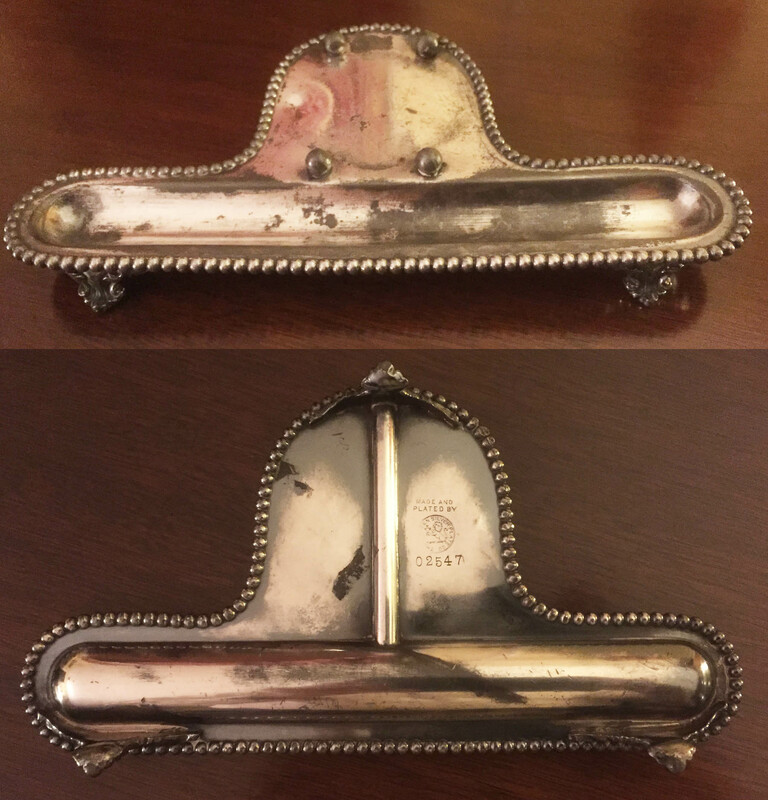 I recently found a Meriden Silver Plate Ink Stand at a thrift store and although it had a lot of plate loss and was missing its ink well, I purchased it. The mark was clear and almost complete but something caught my eye along the reinforcing rib that runs from the pen area through the ink well area, right in the center of the piece. 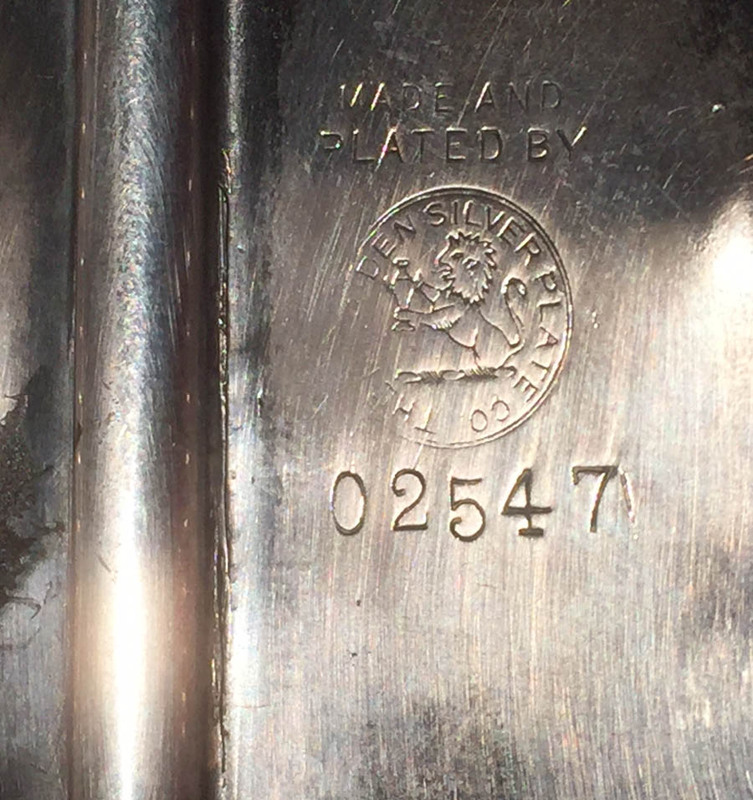 When turned at just the right angle, a second imprint of the 02547 item number is just barely visible running parallel to the reinforcing rib but has been buffed out. I suspect that someone placed the first mark in the center of the piece not knowing that it would be obscured by the reinforcing rib. Before leaving the factory, the first mark was removed, the reinforcing rib installed and a new mark added. Had this been a later repair and not done in the factory, there wouldn’t be a second mark. Such hidden traces help reinforce the fact that while industrialization facilitated greater production of items at a more affordable cost, there still was a lot of hands-on involvement. One could imagine a fairly young apprentice just learning the trade being assigned the job of placing the mark and given his level of experience wasn’t aware that this particular piece had another element to be put on. Before placing the rib, the mistake was discovered and corrected and item completed. Whatever the actual reason, I find these forensic details fascinating. Since the thrift store only had the stand I decided to do some research to determine what type of glass ink well would have come with it. The four round balls held the ink well in place and worn areas of the plate are visible suggesting a lot of use over the years. The wear marks at first glance appear circular so I assumed that there would have been a round inkwell sitting there. Going to the large scrapbooks, which are about 5” thick, I was able to locate the section on inkwells relatively easily in of one of the volumes. Since the items are organized by type and number and appear to have been added over a long period of time all of the same type of objects are not located in one volume. Notes at the end of the ink well section in the first scrapbook directed me to where the series continued in a subsequent scrapbook. There on page 173 was a great catalog image of item 02547 with its missing glass ink well that originally cost $6.00. Instead of being round as I suspected it was actually hexagonal cut glass. The ink well is also shown by itself as item 02543 for $3.50. Upon closer inspection of the wear marks along with the catalog image it is obvious that the original ink well was not round. At least now I know what to keep my eyes on the lookout for. Ronald Abbe of Meriden, Bill Carabetta of Meriden CT, Ellen Carter of Glastonbury CT, Jane Mulligan of Meriden CT, Rick and Sue Reale of Meriden CT, Matt Zierler of Okemos MI, and to our new corporate member, New England Capital Financial Advisors Llc of Meriden CT.
Agnes Baur, Arnold E. Hayes III, Bruce And Sue Burchsted, Cecelia Flagg, Deborah Hanna, Daniel J. Metz, anonymous, Doe Bartlett, Ellen M. Carter, Frank Chiarenza, Gregg Hugo, Jacquelyn Beale, Jan Fontanella, Janet Pestey, anonymous, John G. Arndt, Lawrence & Stacia Morehouse, Lawrence M. McGoldrick, Lesley Solkoske, Lorraine Hancock, Matt Zierler, Paul S. Butkus, Robert & Theresa Rao (IMO Carrol Lyle), Roger Kemp, Ronald J. Stempien, Ruth Ann C. Davis, Ruth Grandy, Sharon Deming, Sherwin & Ruth Borsuk, Suzanne E. Zajac, Thomas Marshall, the many visitors to the Andrews Homestead and to the Research Center who dropped cash into our donation jars, to the Estate of Ruth Snyder, and to the Wave Crest Collectors Club (IMO Carrol Lyle).